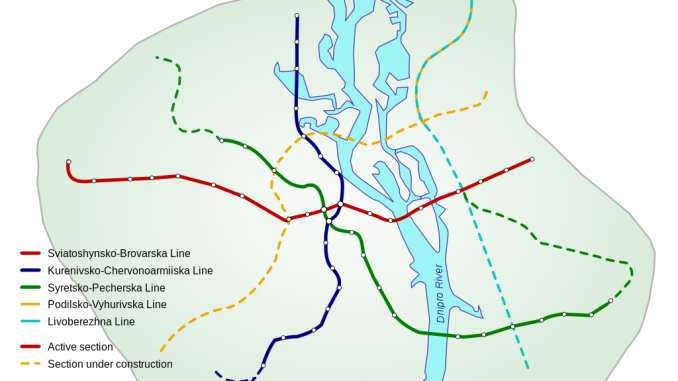 This article discusses plans of #Kyiv City Council on construction of #fourth metro line. Kyiv City Council approved budget for construction works on fourth underground line, which is bound to connect left bank district Troyeschyna and International Kyiv City Airport Zhulyany. It is expected that the line will consist of 16 stations (two of which will be interchangeable with other existing metro lines) with overall length of 20.6 kilometers. According to Kyiv City Council, construction of the metro line will cost up to UAH 31.55 billion (approximately USD 1.205 billion). In particular, in 2016 it is planned to spend UAH 635 million (USD 24.35 million), in 2017 – UAH 517 million (USD 19.7 million) and in 2018 – UAH 2.692 billion (USD 102.74 million). As expected, funding will be provided through the city budget, own funds of Kyiv Metropolitan municipal company and by private investors. Earlier, Kyiv Metropolitan municipal company announced tender on project design works (feasibility study stage). The estimated budget of such works is UAH 60.142 million (approximately USD 2.30 million). Furthermore, as previously reported, the Minister of Regional Development, Construction and Housing and Communal Services of Ukraine announced about ongoing negotiations with several Japanese construction companies in relation to completion of construction of the bridge over Dnipro river and building a new metro line in Kyiv. The construction is also planned to be financed by the discounted loans from the government of Japan. We note that recently the Minister of Infrastructure of Ukraine announced that there is no possibility that the Air Express project, which deals with linking of the Boryspil airport with the underground station in Kyiv, is implemented under the current state of affairs. Therefore, there is a need to re-negotiate the scope of the project. Ukraine offered an alternative implementation project model (with allocation of some funds to other transportation projects near Boryspil International Airport), which is being considered by the Government of the People’s Republic of China, which is the main investor of the project.